Omina 2018 was off to a strong start on Day One, with Gisele and Paul Hawken's compelling conversation about Drawdown, but was certainly matched in high-impact presentations during Day Two. Namely, Donna Karan in conversation with Carmen and Celina De Sola of Glasswing; Guatemalan designer Isabella Springmuhl, Colombian jewelry designer Paula Mendoza in conversation with sustainable financier Alejandro Calderon, former editor-in-chief of Nowness Claudia Donaldson, Eco-Age founder Livia Firth in conversation with journalist and sustainability advocate Lucy Siegle, as well as two standout panel discussions. To kick things off, we were taken through Donna Karan's fascinating journey, from her start - how she accidentally fell into the role of designer (she was looking for a bodysuit for her yoga practice), to the creation of Urban Zen - her wellbeing-focused lifestyle brand. The talk was underpinned by her bold holistic philosophy: "Take care of your mind, spirit, body and your community. The new methodology is you." 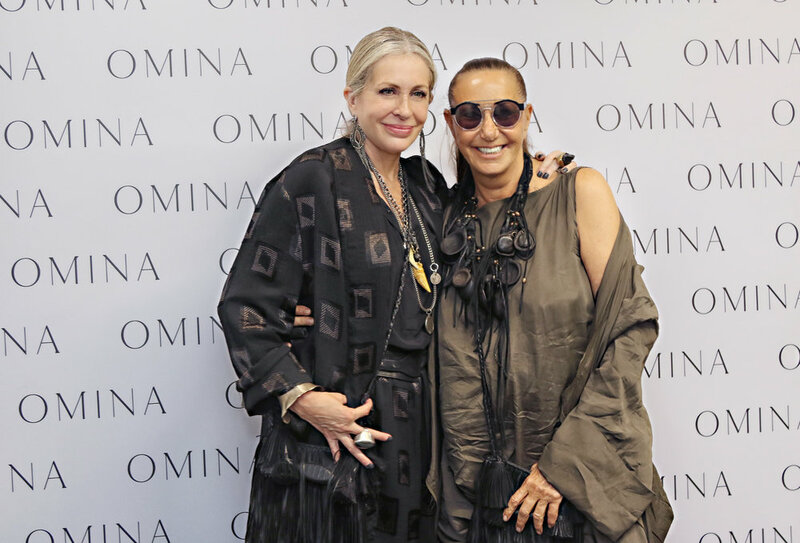 Designer Isabelle Springmuhl with Carmen at Omina 2018. “I applied to the local university. They denied me. I was devastated. But I fought, and I became a fashion designer." The 21-year-old Isabelle blew everyone away with her unshakable confidence and story of resilience and determination. She spoke about her condition - Down's Syndrome - and all the challenges that have come with it, but how nothing stopped her from living the creative life she sought to lead, and from empowering the female artisans of her home country, Guatemala. Her talent has taken her all the way to the UK - she was the first designer with Down’s Syndrome to showcase her collection at London Fashion Week. Jewelry designer Paula Mendoza and sustainable financier Alejandro Calderon. In the afternoon panel, 'Designing for Sustainability' Adriana Cachay (AYNI, a Peru-based knitwear brand working with local artisans to empower women), Oscar Ruiz (Obra Gris, a Costa Rican fashion brand committed zero waste), Bia Saldanha (Veja - a Fairtrade Brazilian shoe brand) Jag Gill (Sundar, a digital sourcing platform) and Carmen's sister Maria Busquets (founder of childrenswear brand Cashmirino, which employs female artisans) spoke with Lucy Siegle. All brands were impressive in their commitment to sustainability, and in sharing their challenges, empowering others and focusing on the human angle, but not foregoing great, aspirational design. Maria Busquets, founder of Cashmirino, talks at the panel "Designing for Sustainability" at Omina 2018. The last panel of the day was moderated by Andrea Somma, co-founder and CEO of the Omina Summit, with panelists Valeria Hinojosa (blogger and entrepreneur - Water Thru Skin), Paloma Teppa (Plant the Future, biophilia), Céline Semaan (Slow Factory, fashion activist), Patrick Duffy (Global Fashion Exchange, swap market), Dria Murphy (Alise Collective, sustainability PR and consultant), and Luis Diego Quirós (Dean, Veritas University). Valeria, who was in the finance industry prior to committing to a more grounded and ethically focused lifestyle, is creating a sustainable lifestyle app to help others discover, hotels, vegan eateries and brands that fit with this ethos. Guatemalan fashion designer Isabella Springmuhl Tejada. Stay tuned for Day Three at Omina Summit 2018 in San José, Costa Rica. Read Day One's highlights here.